I just finished my part of work on the revision of our studio book about clay and so I thought I would show you a ceramic artwork this week. As an art historian, I enjoy making connections between cultures. There are many native cultures in the US, particularly from the East to the Midwest, that don’t get as much study as Plains or Southwest cultures. I find Mississippian cultures fascinating. The Mississippian cultures of mid-United States, which flourished from 900 through 1700 CE, descended from the so-called “mound-builder” cultures of the late prehistoric period. The Mound Builders constructed mound lodgings and burial chambers of pounded earth with thatch roofs. The Mississippian cultures included the Chickasaw, Cherokee, Chicamauga, Chisea, and Shawnee bands, among many others. The earliest report of European contact with these cultures indicates that the cultures built their towns on the mound foundations left by their ancestors. The Mississippian cultures were primarily farmers who raised vegetables, tobacco, and corn. After the middle of the eighteenth century, they acquired horses, cattle, and pigs from the English settlers and began raising a considerable number of livestock. The Mississippian cultures had an extensive trade network by land and via the Tennessee and Mississippi Rivers that extended from the Great Lakes to the Gulf of Mexico and from the Mississippi River to the Atlantic Ocean. 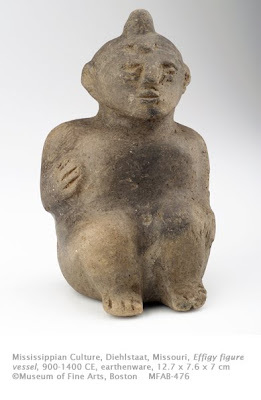 Although no actual Mexican artifacts have been found at Mississippian sites, artistic evidence exists of contact with the Mesoamerican Mexican cultures. Some of the greatest Mississippian artworks are ceramic renderings of human beings. This type of rendering, which was probably influenced by the Mesoamerican culture in Mexico, is noticeably absent (other than in abstracted form) from Plains, Woodlands, Pueblo, and California art. These effigies are thought to represent ancestor figures that would have been placed near a deceased person during burial ceremonies. They also appear on pot handles and lids. Another theory is that, like the Mesoamerican culture that influenced them, the Mississippian peoples had special societies that honored warriors. The pose of this figure is a common characteristic of these sculptures and may represent part of a ritual dance performed in these warrior guilds. The simplification of form, which includes the flattened pyramidal nose, is also an element of Mesoamerican influence. This Illinois educational website has a good overview of Mississippian cultures. This is a good website with overview of Mississippian art. The MFA in Boston has an awesome collection of First Nations ceramics from all over the US.